Don’t be left behind! Newton-Wellesley Hospital’s 4th annual HopeWalks event will be held on Sunday, September 29th. HopeWalks is a 3.5 mile neighborhood walk to benefit the Integrative Support Services offered at the Vernon Cancer Center. These life-enhancing services for cancer patients optimize healing and comfort throughout treatment. Newton-Wellesley Hospital wants to continue making these services available to all patients, regardless of their ability to pay. 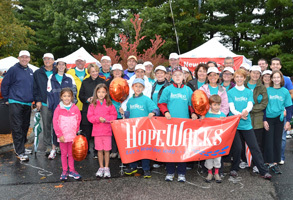 HopeWalks begins and ends at Newton-Wellesley Hospital. Check-in begins at 9:00 am; Opening Ceremonies with MIX 104.1’s Sue Brady as Emcee; walk begins at 10:00 am – rain or shine. After the walk there will be a barbeque for the participants and other activities/surprises. For more information, contact (617) 243-5915 or hopewalks@partners.org. Register online today atwww.nwh.org/hopewalks.